My Slow Cooker Apple Cinnamon Raisin Bread Pudding recipe and this blog post was sponsored by KING’S HAWAIIAN® but the opinions are all my own. It’s served nice and warm right out of the slow cooker, and tastes extra yummy with a dollop of ice cream. You’ll want the bread to be day-old, but if it’s not (and mine never is), don’t worry. There’s an easy solution. But first cut the Sweet Round Bread into big cubes. 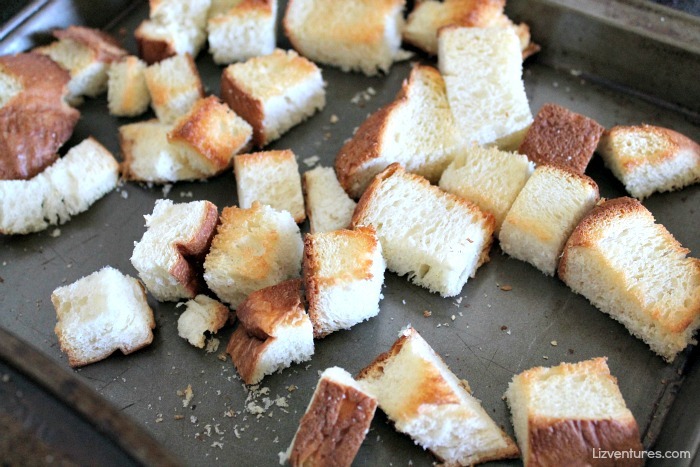 If it’s not day-old, toast the bread cubes on a cookie sheet under the oven broiler until lightly browned. See? I told you there was an easy solution. Butter the inside of the slow cooker, and then put the bread cubes, apples, raisins and brown sugar in it. Pour the egg/milk mixture over the top, making sure every piece of bread is soaking up the goodness. Then cover and let the slow cooker do its thing for a few hours. Butter sides and bottom of slow cooker. Add bread cubes, apples and raisins to slow cooker. Sprinkle brown sugar over top. In a medium mixing bowl, combine eggs, sweetened condensed milk, regular milk, vanilla, salt, nutmeg and cinnamon.sugar. Beat until well mixed. Pour over bread, making sure each bread chunk is soaking up the mixture. Cook on low for 3-4 hours, or until knife inserted in center comes out clean. Serve warm. 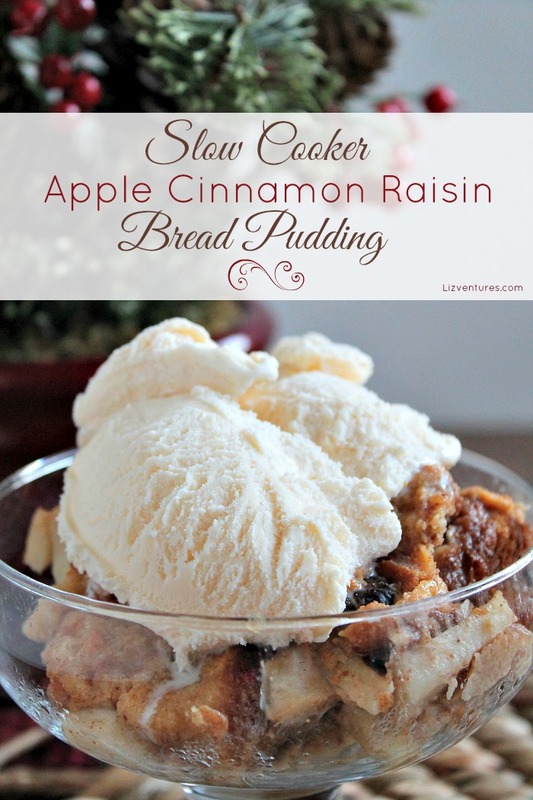 You’ll end up with this delectable slow cooker apple cinnamon raisin bread pudding. Get holiday ready with these KING’S HAWAIIAN holiday helpful ideas, tips and recipes! What’s your favorite way to serve KING’S HAWAIIAN over the holidays? Bread pudding is one of my favorites and this recipe looks delicious! This looks so yummy! Slow cooker recipes are the best. Thanks for sharing at Merry Monday, see you next week! I’ve never made my own bread pudding but this sounds so simple! And it looks delicious, too! Thanks for linking up with Merry Monday. Yumm-yyyyy!!! I love trying bread pudding recipes! Thanks for sharing with #HomeMattersParty! Why don’t people try the recipe and then comment, of course it looks good you don’t have to tell us; you intend to make it, who cares, what we want to know is how did it taste after you made it; I think my family would love it, well tell us how your family liked it after you made it; I will make it after I get the ingredients, get your ingredients, make it and then tell us how it tasted; so happy it can be made in the slow cooker, make it in the slow cooker and then tell us how it turned out; I like the idea of ice cream on it, make it, put ice cream on it and then tell us how you like it. Review recipe people, review!!!! What a perfect idea for a holiday dessert! Definitely festive and, frankly, the less time I spend in the kitchen on holidays the better. Slow cooker dishes are my bestie on those days. Thanks for sharing your recipe with us at Merry Monday this week! Wow, I love apple desserts, this one looks so easy to attempt! Pinning to my apple desserts board! That looks AMAZING! I just got a new slow cooker for Christmas so this may be the first thing I make! Wow, that sounds amazing too.. wonder how to lighten that one up a little.. with that one, maybe some applesauce in exchange for a few of the higher fat/sugar ones.. but LOVE the crock pot meals. YUM! I bet the house smelled amazing while this was cooking. Definitely adding this to my Pinterest board for slow cooker recipes. This sounds amazing!! 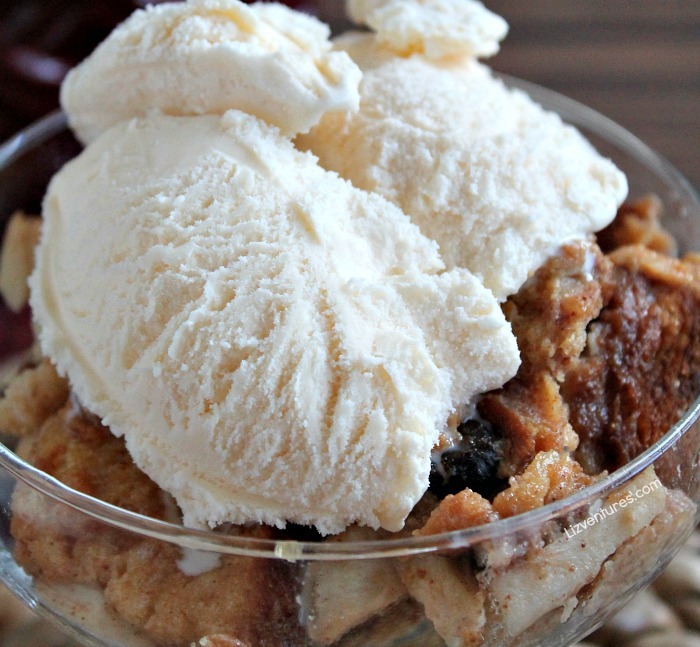 Bread pudding is one of my husband John’s desserts, love the idea to put ice cream on the bread pudding. It has been ages and ages since I’ve had bread pudding. I will certainly have to try out this recipe sometime. It looks sooo good! Love all the ingredients and it looks just amazing, can’t wait to try it! That looks sooo good Liz! I haven’t had bread pudding since I was a kid. I will have to try this recipe. This looks divine. I love a good dessert. So want to make this soon. YUM! That looks absolutely amazing! I love bread pudding, but never knew how to make it. This flavor combo is just perfect! I’ve never had this. Now I want to try it so bad. I bet my dad would like it to. He talks about a bread pudding that his grandma used to make him. King’s Hawaiian Bread is a huge favorite in our house. Even though I am not a huge fan of bread pudding my children love it and they would also love it if I made it for them. Ok you had me a slow cooker 😉 I’ve never made bread pudding before but if you can use a slow cooker, well I might just have to try your recipe. This looks super tasty! I love apple recipes! My goodness, this looks absolutely delicious & I love how it has come out so good finally. Bread pudding is one of my favorite food & I love this wonderful combination so much. I was looking for a bread pudding recipe, I can’t wait to use yours on our Christmas brunch! Yummy! This sounds amazing! I love bread pudding! I love bread pudding–this one looks really yummy! I’ve never had or made bread pudding before! This definitely sounds like an interesting recipe! I agree, it is definitely very interesting. I imagine that the flavor combinations are delicious. I’m always looking for new and different slow cooker recipes to try and I will be adding this to my list! I LOVE King’s Hawaiian products and craved their sweet rolls when I was pregnant with my last! lol! I’m speechless! This looks and sounds so good! Love the slow cooker option too especially during the next two weeks. i am always looking for new slow cooker recipes. This looks so delicious and easy to make. I will have to try it this week. Mmm yum, I think my family would enjoy this. Wish I could try this bread, but I’m gluten free! Yummy it looks so good. I have never had bread pudding with Hawaiian bread but since it’s already a family favorite, I would imagine so would this be. Sounds like the perfect dessert for the holiday season! I could definitely use a scoop or two of ice cream on top! I have never tried bread pudding but these pics look delicious. I want to make this . It doesn’t seem very difficult and I’m not much of a cook. This looks delightful! I make a mean bread pudding myself – one of the only two things that I bake well. Never thought about a slow cooker version though. I love the sweet bread that you used. This looks like something I would serve for the holidays, great dish. I just had bread pudding for the first time. It was really good. I may need to make this. I love bread pudding! This sounds so good! I need to try it for myself. Yumm… It looks delicious and I will try this recipe in my kitchen too!! I love using my slow cooker, but I surely never thought of cooking pudding in it. Thanks for the idea and for the recipe. Looks yummy! Yummy. Sounds like an amazing holiday treat. My mother would really enjoy this. This looks really good, it’s to bad that most of my family don’t like raisins. Looks really good though. Oh my, I have never made a bread pudding, but this is making me rethink it. It loos and sounds so yummy! Thanks for sharing! How perfect would this be for Christmas!? It sounds so yummy! I make a breakfast casserole that is very similar. I’m thinking I need to try it in my slow cooker. This looks so good! This is one of my husband’s favorite desserts. I might just have to surprise him with this recipe for the holidays! This bread pudding looks to die for! I really need to try this recipe. Oh my gosh, this looks aboslutely delicious! You’re such a tease, now I want some lol. Looks absolutely delicious! Now I love my slow cooker even more! I will definitely make this tomorrow. Yum! This does sound good. I just tried the limited edition Bread Pudding coffee by Community Coffee… such a nice flavor. I’d love to try the real deal. I love this. I just showed it to my husband and we are going to make our own tomorrow. He got so excited he went out to the store to get vanilla ice cream! Pinned your recipe. That looks so good! I would have never thought about using Kings Hawaiian for bread pudding! To be honest I droll seeing your photos, so tasty. I cant wait to try this out this weekend or this christmas this would be a very nice experience. Bread pudding is one of my most favorite desserts. This one looks top notch! Bread pudding is one of my favorite desserts! I bet the apple cinnamon combo is to die for! This looks amazing. My mom always made a favorite English break pudding with raisins every Christmas but it was something that took several days to make. I do remember it was awesome. Your recipe is much simpler and looks great. I love this recipe! I think this would be delicious sans the raisins but great presentation! Slow cookers are such a great way to cook. I like the way the house smells when the slow cooker is creating its delicious magic. I have never made bread pudding before but it looks so good! Perfect for the holiday parties this week. Looks so yummy. Great recipe for Christmas morning. This looks scrumptious. I want to give this bread pudding a try. This looks so moist and I bet it is quite flavorful with the apples. I have never tried making bread pudding in my slow cooker before. This looks like a delicious recipe. I will have to give it a try. My family is going to love it. This looks fabulous and such an easy dish to make for the holidays. I have never made a bread pudding before but this one looks fabulous!! Great recipe!! How can you not love this! It’s so easy to make and the end result looks heavenly! I would love to eat something like this right about now, it’s a nice comfort food. This looks amazing. I honestly don’t think I’ve had bread pudding before. I’ll have to try this out because it certainly sounds good. Kings Hawaiian is my favorite too, so I bet it tastes great! Wow! That looks so delicious! I love slow cooker recipes and I will definitely make some of this! It’s so easy to do, isn’t it? I love slow cooker recipes as well! Always a treat! So this sounds amazingly lethal in a great way. We have a slow cooker and I am going to suggest to my spouse that we try this over the holiday break. Thanks and Merry Christmas! There is no wrong way to ever serve Kings Hawaiian. I normally just eat the rolls with too much butter on them, but your recipe looks amazing! That looks so good. I’ll have to try to make it for my family sometime. This looks and sounds absolutely amazing. I need a few bowls full for sure. That. Looks. AMAZING! I love that it can be made in the slow cooker. That is my favorite way to cook anything. And we are big Kings Hawaiian fans here. I think I am going to try that this weekend when the family arrives! We are big fans of bread pudding. This recipe sounds so good and I like that it is a slow cooker recipe. My husband loves bread pudding. I am going to try to make this for him! This looks so delicious especially with the ice cream. I love a good slow cooker recipe! It is perfect for my busy schedule. I have to agree. My slow cooker has been calling my name. I really need to make something like this so I can have ice cream. That looks so good! What a prefect treat for this cold weather. I have never had bread pudding before, but this looks delicious. I am also a fan of how easy it is. I may have to give this a try! This looks so good, Liz! I love using my slow cooker, especially when I’m entertaining. This slow cooker dessert looks wonderful! That sounds and looks amazing! 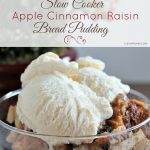 I’ve never made bread pudding before but this seems easy enough and I sure do love my slow cooker! Thanks! Wow this looks and sounds so good. I’d never think to do this and the fact its in the slow cooker makes it all that much more appealing to me. This looks just delicious! I love me some King Hawaiian bread, I had no idea this was among-st the possibilities. This bread pudding sounds perfect for Christmas Morning! Plus I am loving that it is all done in the slow cooker! That is my favorite way to cook right now! Yummy it’s looks so good, I’ll have to try to make this for my family sometime soon. I’ve never made bread pudding before. The apples and raisins sound really good. Thank you for sharing another easy to make yummy recipe! I will surely try making this bread pudding. I know my family will enjoy them. This looks heavenly I have never tried bread pudding before. Making this for breakfast tomorrow! With the kids off school we have the luxury of time and they would love it! One of my most favorite desserts of all time is bread pudding. Bookmarking! Your recipe for Apple Cinnamon Raisin Bread Pudding sounds delicious. I love that it’s made in the slow cooker! Would be perfect to serve at the holiday gatherings coming up. Once things slow down a little, I want to try this recipe. I use my slow cooker quite often, and have more than one… or two. I have 4 upstairs and then a unit that has 4 built in. Who knows why I have so many, but I do use them. Yum, that does sound good. I love that it can be made in the slow cooker to free up my oven on the holidays. Looks delicious I have been buying my Raisin Bread pudding at the grocery store, which is loaded with, refined sugar now that I have your recipe I can make it with just the way I like. This looks so good and easy to make! I have to try this recipe. It looks delicious and festive! I love the idea of the ice cream on top. Completely delicious. This is so perfect for cold, Canadian winters. Thanks so much for sharing this. I can’t wait to try it! It hasn’t gotten very cold here yet in Georgia. I’ll have to try it anyway and pretend like it feels like winter outside. Not cold here either, but I still want to enjoy the cold weather treats like this one. ? This sounds yummy! I do love King’s Hawaiian toasted! I will have to share this with my father and sister. I think they both love apple bread pudding. Your pictures are excellent and your recipe is very neat and orderly – big fan! We make bread pudding every Winter, multiple times- usually an overnight bake recipe. I’ll have to give the Crock-Pot version a go. Thanks for sharing! I love a good bread pudding! This one looks like it would be delicious. This looks so yummy. That bread makes it special. I absolutely love bread pudding and being able to make one in the slow cooker while I go about my day is an extra special treat. I love King’s Hawaiian and I love Bread Pudding – this is one recipe I will HAVE to make! This is genius! I never ever thought about doing Kings Hawaiian bread pudding before that is a great idea. This bread pudding was running through my dreams. I drove about 15 miles yesterday outside Atlanta just to find a piece of bread pudding. Next time, I’ll try your recipe instead. THis looks like a great dish. I have not even thought of making a dessert in a slow cooker. Oh my this looks so good I wish I had some right now. My aunt makes a guava bread pudding which is to die for, I’m sure this one is just as good! This is the quintessential dish for Christmas isn’t it? Really lovely and yumm! What a great recipe! I’ve always though of slow cookers for main meals, definitely one to try. My mom would flip out over this. Flip. Out. She loves bread pudding, and she absolutely devours King’s Hawaiian Bread. I am a slow cooker fanatic. This recipe looks different and like something I would love to try. Another fantastic sounding slow cooker recipe! I love the idea of serving this at holiday time. Yum! Bread pudding is a favorite at my house. This one looks especially delicious. Best bread pudding recipe EVER! 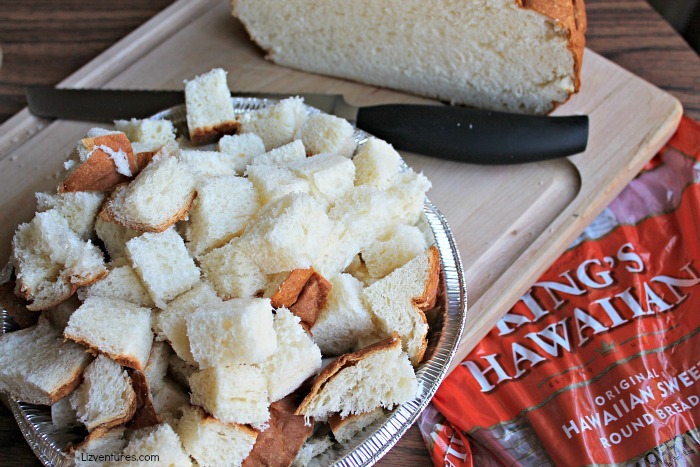 King’s Hawaiian is the best sweet bread out there, and I think it’s perfect for this kind of recipe. I have never had bread pudding and did not know you could make it in a slow cooker. This looks and sounds absolutely terrific! I haven’t had breakfast yet and wish I had a bowl to try right now. What an awesome way to use Hawaiian rolls! Addie will love making this awesome dessert with me! This looks so amazing. I did not know you could make this in a slow cooker! You know, I love my slow cooker yet I don’t think I’ve ever made a dessert in it before. This looks delicious and may be my first slow cooked attempt at a dessert! I can honestly say I’ve never had bread pudding from a slow cooker. After seeing your photos, I’m wondering why not?! Oh my gosh, bread pudding is my favorite! I will be trying this for sure! Few things are as comforting as bread pudding. And this one looks particularly so, with the apples and raisins, two of my favorite things. 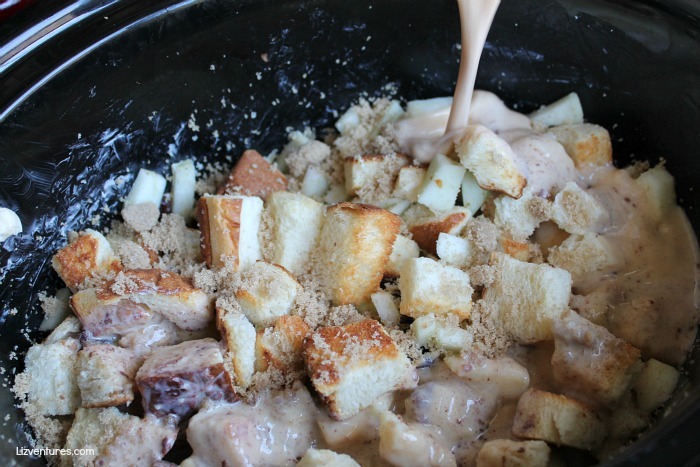 I’ve never tried making bread pudding in my slow cooker, but I think it’s time! Thanks for the recipe. This recipe is awesome! I love to make desserts in my crockpot. Bread pudding is one of my favorite desserts. I would love to make this in our slow cooker. Bread pudding is a dessert staple in our family! OMG, we gobble it up like there’s no tomorrow. Yours sound ah-mazing. This looks amazing and I love that it’s done in the crockpot. I have to try this before the diet starts! This just looks yummy! I love Kings Hawaiian Rolls and just today I picked up a few at Walmart because my daughter just LOVES them. Great for snacking. I am doing a little happy dance over here. I LOVE bread pudding and you don’t see it too often. I love it with a little bit of sauce and vanilla ice cream. So tasty. Yummy! I have never had bread pudding but this looks like something I want to try!! You totally need to try it. It doesn’t taste like you think and it;s oh so yummy! I have had bread pudding but this recipe still looks so good. I like the idea of putting ice cream on top of it. I bet this tastes amazing! The Hawaiian bread gives it more of a sweet flavor! THIS LOOKS REALLY DELICIOUS. I LOVE THE ADDITION OF ICE CREAM ON TOP.